I wanted to share the following information as I am very proud of our operations department. Last night the operation department was recognized by the Lytle VFW and awarded the community service award for our service to the school and community. 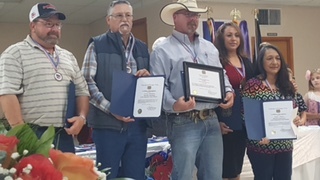 Mr. Larry Sanders is the chief of the Lytle VFW and he asked me to select four members of the operations department to be recognized by the Lytle VFW, this was not an easy task as all operations staff members are deserving. Please see the attachment for a picture of the honorees and see the information below regarding how important these members of our operations department are to me and our schools. I would have liked to take and have had the entire operations department recognized. However, I couldn’t sneak sixty-four staff members in the door. Maybe next year. This being said, all of my operations staff members from the mechanics, bus aides, and custodians are very important to me and do amazing things for our schools, staff, and students every day. It is my pleasure and honor to be their director and serve Lytle ISD. If you happen to see any of our operations guys and gals around, please pat them on the back and say thank you for what they do.